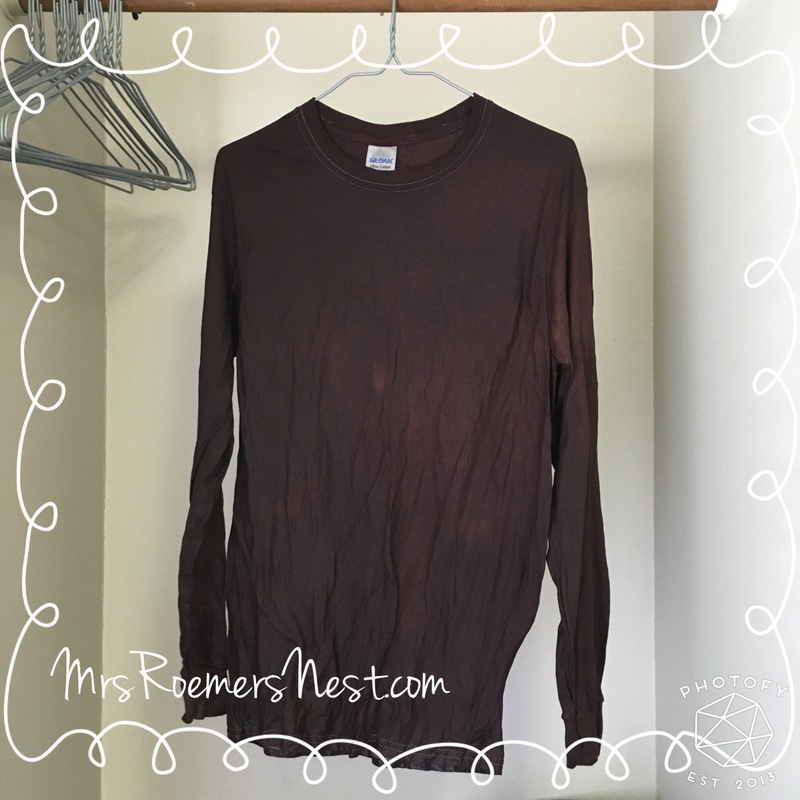 I headed to Hobby Lobby first and they had a great selection of long sleeve t-shirts at a great price…and they were on sale too! Score! But…they didn’t have brown. And I really, really wanted brown. Ok, no biggie. I’ll just dye the shirts. Easy peasy. But…they didn’t have brown dye. They were all out. Ok, no biggie. I’ll stop at Michael’s on my way home. 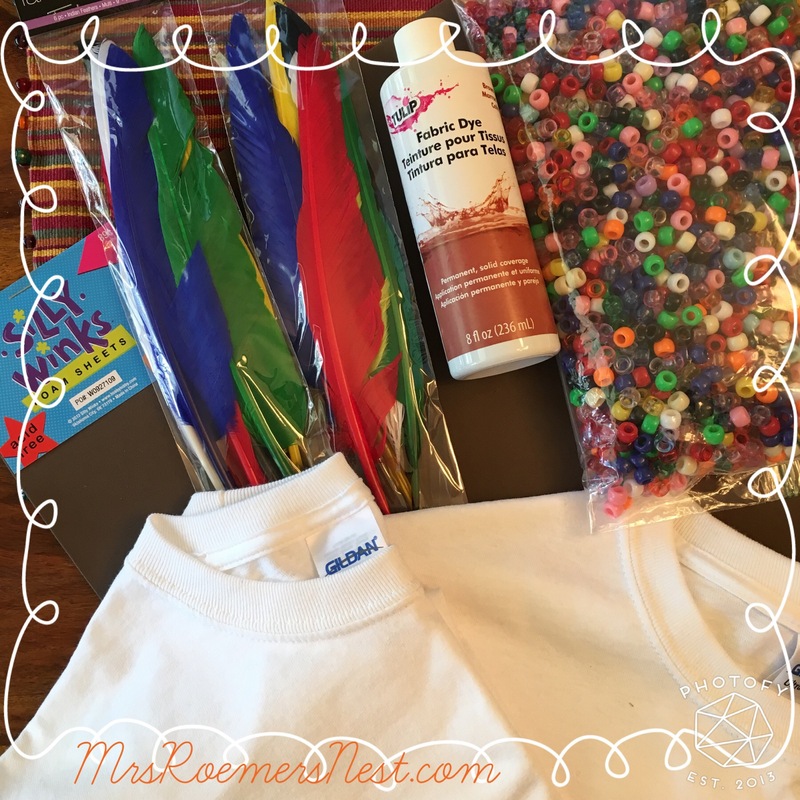 While at Hobby Lobby, I picked up two (I only need one costume but I have a feeling my 3 year old will want one) long sleeved, size small adult t-shirts, 2 packs of feathers, and 1 piece of brown foam board (maybe to help in making a headband??). I already had beads at home left over from another project. So off to Michael’s for some brown dye…I was also hoping they had brown shirts so I could save a step but they didn’t. They had brown dye and I was able to use a 50% off coupon so it came to $2.13! Score! Now…let’s change the color of these shirts because I promised the big kids they could help put beads on when they got home from school. 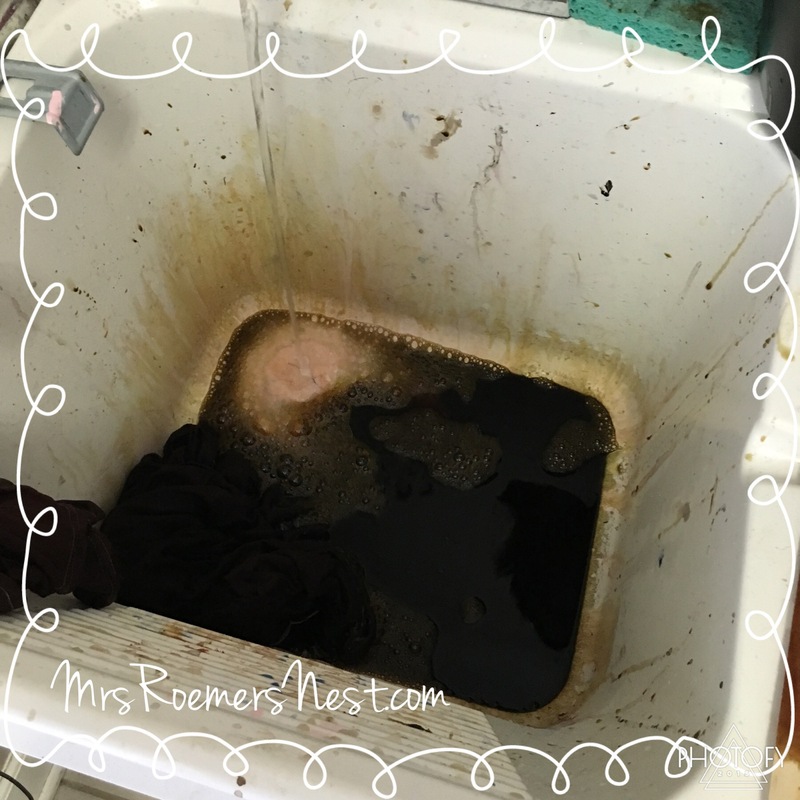 I took a bucket from the garage (thank goodness it’s black), rinsed it out and filled it with HOT water. 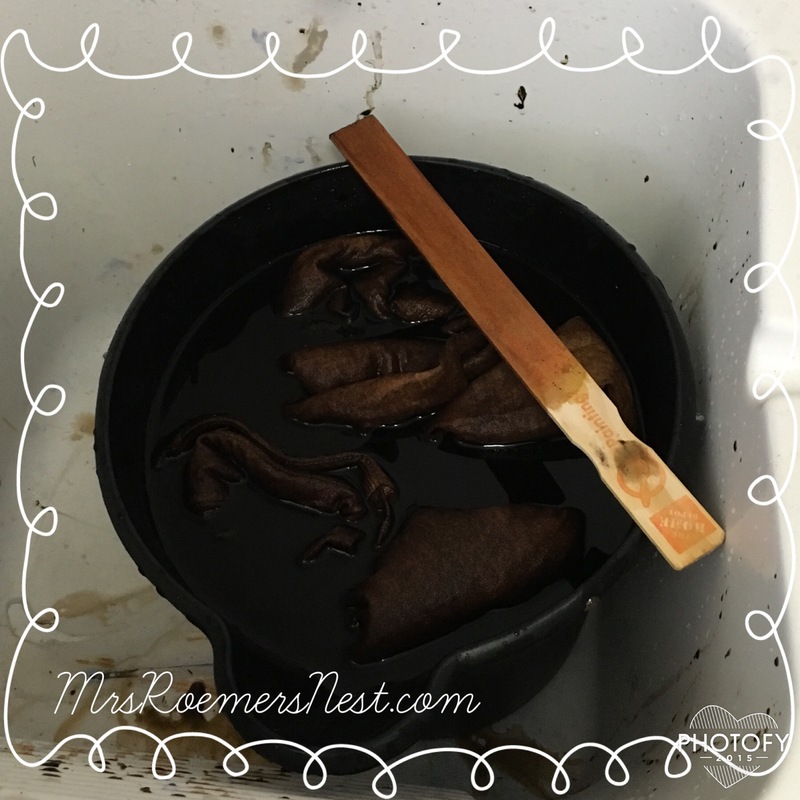 I dumped the liquid dye in and mixed for about 2 minutes before I put the wet shirts in the bucket. The directions say to add 1 cup of salt but I didn’t. 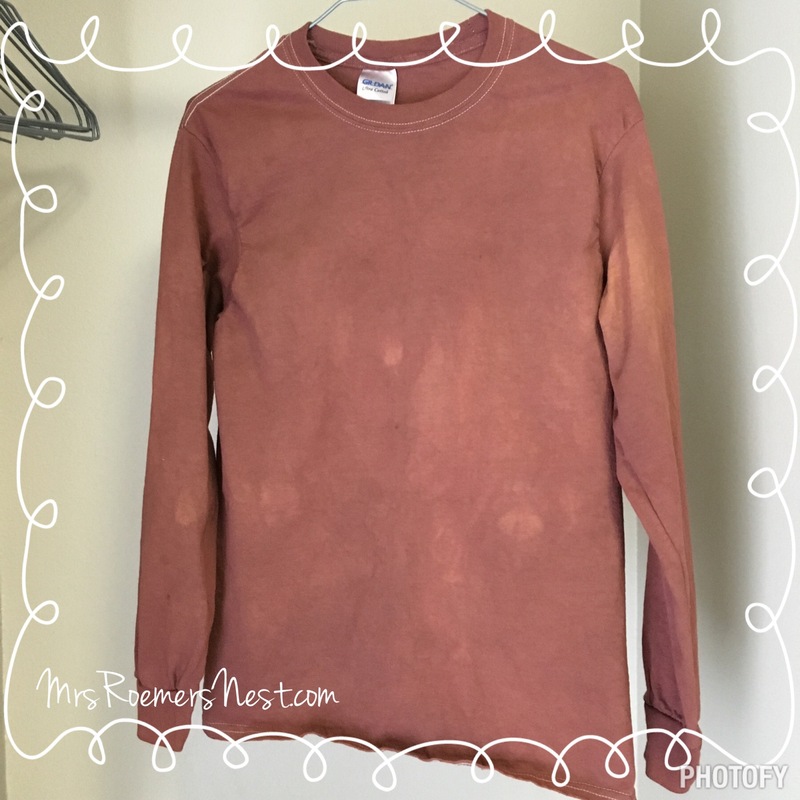 I’m not looking for a perfectly brown shirt. I just need it not to be white and to be kind of brown. Now, the directions say to mix CONSTANTLY for 30-60 minutes. Umm…who the heck has time for that?! And I’m pretty sure my arm would fall off in the process. So I left it and mixed it maybe every 5 minutes for about 30 minutes. After thirty minutes, I very carefully emptied the bucket and started to rinse the shirts with cool water. Talk about a mess! Thank goodness the big kids were at school and the baby was sleeping because this was hard enough to do by myself let alone have my little helpers helping me. 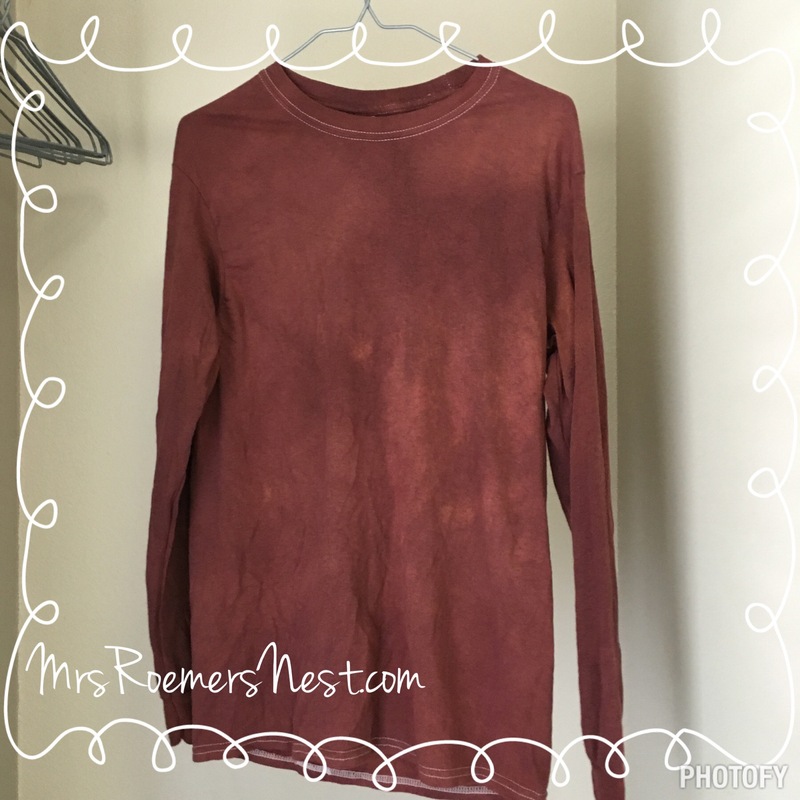 This is what the shirt looked like after I rinsed it with cool water. I tried my best to keep rinsing until the water was clear but I probably could have done a little bit better. Next up, I threw them in the washer and dryer! Definitely a bit blotchy but it will be perfect for an indian costume! Next up, time for the scissors and some beads! For Part 2, click here!